The late Terry Mordue prepared the original version of these notes, with the following introduction. They have been reformatted for compatibility with the Madame Eulalie annotations and slightly edited; a few notes, marked with *, have been added, and a few notes, marked with °, have been revised or extended in light of further information. Two of Wodehouse’s books, The Clicking of Cuthbert and The Heart of a Goof, are devoted to stories about golf, and there are five more golf stories in the collection Nothing Serious. There are also golfing scenes in novels such as Love Among the Chickens and references to the game in A Damsel in Distress, among many others. As many of the terms used will be unfamiliar to non-golfers — even present-day golfers may be puzzled by some of the older terms — I have prepared this brief glossary, which I hope will go some way to increase understanding of what are, in fact, some of Wodehouse’s best tales. The following map of the first three holes on a golf course illustrates several of the features that are referenced in the glossary. The blue, red, and white rectangles are the tees. Greens are coloured bright green, fairways are green, the dark green areas are light rough and the pale green areas are deep rough. Bunkers are coloured gold and water is blue. The position adopted by a golfer when preparing to make a stroke; a player is deemed to have “addressed the ball” when he has taken his stance and has “grounded his club” (touched the clubhead to the ground in the vicinity of the ball)—except in a hazard, where grounding the club is not allowed. A shot played to the green from the fairway or rough. Referring to the golfer whose ball is the longest distance from the hole, who typically plays first. Also known as a baffing spoon: an old club, with a wooden head and, traditionally, a hickory shaft, which was used as a fairway wood, i.e. for playing shots off the fairway. The nearest modern equivalent is a 4-wood. A score of one less than the par for a hole. A special type of handicap stroke awarded to a weaker player in informal match play, which the recipient may use on any hole desired (declaring this before play of that hole); opposed to formal handicaps in match play, which must be allocated to the most difficult holes (as determined by the greens committee) in order. In Wodehouse’s time “bogey” and “par” were equivalent terms for the number of strokes a very good player (one with a zero handicap, a scratch player) would be expected to need for a hole or an entire course. The term “bogey,” from the Scots dialect term for a hobgoblin, came from the practice of a solo golfer “playing against Bogey”—matching his own score against an imaginary opponent. In British military golfing circles, the ghostly opponent was promoted to the rank of Colonel, as in the “Colonel Bogey March” written by “Kenneth J. Alford” (pen name of Lieut. F. J. Ricketts, 1881–1945). Wodehouse, or his editors, felt free to substitute “par” for “bogey” (or vice versa) for publications on both sides of the Atlantic, at least in the golf stories published before World War II. The modern sense of “bogey” as “one over par” arose in the USA after World War II, according to the OED, and was not universally accepted until the mid-1960s, according to Norman Murphy (A Wodehouse Handbook). An archaic term for a wooden-headed club with a brass sole-plate, equivalent to the modern 2-wood. Besides its noun use for a good or bad stroke of luck, the verb is used meaning to achieve a medal score lower than a given standard, as in “to break a hundred”—to play eighteen holes in less than a hundred strokes. A bunker is a hazard which consists of an area of ground, often a hollow, from which the turf or soil has been excavated and replaced with sand, or the like. Bunkers are often employed by course designers to enhance the difficulty of a hole and are usually positioned so as to “punish” a wayward shot. A “greenside bunker” is one located adjacent to the green, usually to the side or rear of the green, and often has a steep face on the greenward side. A “fairway bunker” may be located alongside, or even within, a fairway, with the intention of posing a challenge to the golfer: the good golfer may be capable of hitting a shot that will carry beyond the bunker, while the less proficient golfer may choose to lay up short of the hazard, which lies in wait for those who make the wrong decision or execute a poor stroke. When the bunker runs across the fairway, it is often known as a “cross bunker” (a description of its position, not its temperament). In the course diagram, there are bunkers around the 1st and 3rd greens and a fairway bunker alongside the 3rd fairway. Someone employed to carry the golfer’s bag of clubs. Caddies frequently have detailed knowledge of their local course and may provide advice and assistance on such matters as: the distance to the hole; the best club to use; the line of putt on the greens. Under the Rules of Golf, a golfer’s caddy is the only person from whom the golfer may seek advice during the playing of a round. A temporary (and visible) accumulation of water on the course (but not in a water hazard). Under the rules, a player is allowed to take relief from casual water, without penalty, by lifting his ball and dropping it (or placing it if on the green) clear of the casual water. A chip shot is one in which the ball flies a relatively short distance through the air on a low trajectory and then rolls a greater distance along the ground. Typically, a chip shot is played from very close to the green, either from the fairway or from light rough that fringes the green, with the intention that the ball should stay in the air only as long as is needed to reach the putting surface, before it then rolls on towards the hole. The chip shot is usually attempted only when there is no obstruction on the path of the ball, unlike the pitch shot, which is used if the ball must clear an obstruction such as a greenside bunker. An old club, originally any iron-headed club but later referring to a driving iron, equivalent to the modern 1- or 2-iron. The striking surface of the club head. In relation to competitions, “Committee” refers to the committee that is in charge of the competition; otherwise, it refers to the committee that is responsible for the course, sometimes called the Greens Committee. 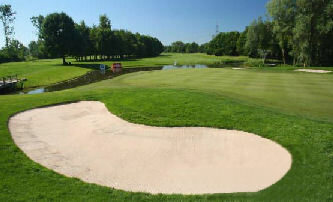 The course is the entire area within which play is permitted and includes teeing grounds, fairways, rough and greens. A ball that lies so close to the hole that it is almost certain to be holed at the next stroke is said to be “dead.” To “lay the ball dead” or “drop it dead” is to execute a shot that places the ball in such a position. A piece of turf removed by the clubhead as it strikes the ball. Professional golfers deliberately take a divot when they execute a shot with the intention of imparting backspin to the ball. Amateurs are more likely to take a divot by accident, usually as a result of a poorly-executed shot. Golf etiquette requires a golfer to repair any divot holes that he makes, so as to leave the course in reasonable condition for other players: a player whose ball comes to rest in a divot hole is not allowed to take relief and must play the ball as it lies. A hole that changes direction abruptly at some point between tee and green. In the course diagram, the 1st hole is a dog-leg when played off the back tees (the blue and white rectangles), but not from the ladies’ (red) tee. A situation arising in match play when one player (or team) cannot lose because he is leading by as many holes as there are left to play. The opposite of a fade: a shot in which, for a right-handed player, the ball is made to curve to the left in a controlled manner (as distinct from a hook, which is uncontrolled and unintended). The initial shot from the teeing ground of a long (usually par 4 or 5) hole. A club, formerly wooden-headed but now more usually made of a modern composite material, with a small amount of loft and specifically designed for long-range shots off the teeing ground. An unskilled beginner. OED has American citations beginning in 1887 including later quotes from George Ade and Harry Leon Wilson, authors who were read by Wodehouse. The opposite of a draw: a shot in which, for a right-handed player, the ball is made to curve to the right in a controlled manner (as distinct from a slice, which is uncontrolled and unintended). That part of the playing area of a hole, between tee and green, which is kept close-mown. In the course diagram, the fairways are the green areas on which are marked the hole numbers. To bungle a shot or otherwise make a mess of something. Not an official golf term, but one appearing often in Wodehouse’s stories. OED links it to German dialect fuseln, to work hurriedly and badly. A warning shouted to other players (or spectators) if there is a risk that they may be struck by a wayward ball. It is considered extremely poor etiquette to play a shot if there are players ahead who are still within range of the shot. But if the leading group is playing much slower than the following group, good etiquette demands that the leading group stand aside and “wave through” the following group, rather than hold up the faster players. Wodehousean slang for a golfer who becomes morbid about his failures at golf, ruining his chances for success both on the course and off it. See “The Heart of a Goof” for a full explanation. A specially-prepared area surrounding the hole and on which the grass is kept very short, to enable strokes to be played with a special club, the putter. In the course diagram, the greens are shown in bright green. The “gutty” was a golf ball made of gutta percha, a substance derived from the latex of various trees indigenous to Malaya. The gutta percha golf ball was introduced in 1848 and was the dominant type of golf ball until the early 1900s, when it was replaced by the Haskell ball, which, with its core of tightly-wound rubber, was the forerunner of the modern golf ball. In match play, to halve a hole is to tie one’s opponent’s score for a hole, to hole out the ball in the same number of strokes. Each player scores ½ in the total of holes won so far. To halve a match is to win an equal number of holes. A player’s handicap reflects the extent to which his ability is inferior to that of a scratch player and is expressed as a number of strokes: the poorer the player, the higher his handicap. Properly calculated, handicaps allow players of different abilities to compete on fair terms. In medal play (strokeplay), a player’s handicap is deducted from his gross score for a round, the result being his “net” score. In match play, the differing abilities of the two players are equalised by the stronger giving the weaker player a number of strokes, as determined by the difference in their handicaps; the holes at which these strokes can be utilised is determined by the difficulty rating of the holes on the course — e.g., if a player with a handicap of 12 competes against a player with a handicap of 19, the latter will receive an extra stroke at each of the seven most difficult holes on the course. It is the responsibility of the Committee to publish a table listing the order of difficulty of the holes. It is usual for the order to alternate between the front and back nines (thus, if the hole rated 1, the most difficult, is on the front nine, that rated 2 will be on the back nine, and so on). Coburn Haskell, an Ohio golfer, and Bertram Work, of the B. F. Goodrich rubber company, patented a new style of golf ball in 1899 with a central rubber core surrounded by a tightly-wound ball of rubber thread, covered by a tough molded cover originally made of balata sap, later replaced by various synthetic resins. The Haskell ball and similar variants predominated through the first two-thirds of the twentieth century. Any area of the course designated as such by the Committee. Hazards are either bunkers or water hazards, the latter being subject to their own special rules. As a verb, the word describes the action of striking the ball into the hole (noun); frequently expressed as to “hole out”. As a noun, it refers to either the 4¼-inch diameter cup sunk into the putting surface and into which the ball is to be played, or to the entire playing area between tee and green. In the latter case, it may be prefixed by a description, e.g. the 16th hole, the water hole, the dog-leg hole. A full-sized golf course consists of 18 holes. The right to play first off the tee. At the first hole, the honour is often determined by a toin coss; thereafter the honour goes to the player who won the last hole (or who had the honour at that hole if the hole was halved). The opposite of a slice: a shot in which, for a right-handed player, the ball curves strongly to the left in an uncontrolled manner (as distinct from the controlled draw). A way of gripping a golf club in which the little finger of one hand is intertwined with the index of the other hand, the theory being that this encourages the two hands to behave as a single unit; this grip is the next most popular after the overlapping grip. The terms “long iron” (numbers 1–4), “mid iron” (5–8) and “short iron” (9 and wedges) reflect the distances achievable with these clubs. An old club with a narrow, lofted iron head, used for approach shots and chipping. Also known as a pitching niblick, or lofting iron. Describes playing against an opponent of the same skill, with an equal handicap, or (during play) having an equal score with one’s opponent. The term originally applied to areas of wasteland alongside the coast, usually consisting of old sand dunes overgrown with grass and other vegetation. As many of the earliest golf courses were built on such areas, the term came to be applied to such courses, and, by extension, to all golf courses. Links courses in the strict sense are characterised by an exposed, windswept coastal location, an almost total absence of trees (though often plentiful bushes), and a topography of undulating mounds or dunes. 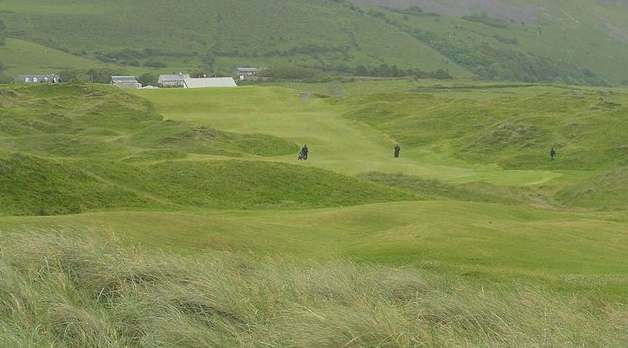 By tradition, The Open Championship is always competed for on links courses. 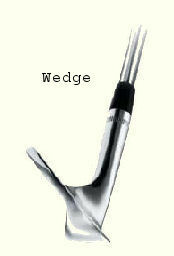 The angle of deviation of the club face from the vertical. A 1-wood (or driver) typically has a loft of 10° or less, a 1-iron has a loft of around 18°, while some wedges have a loft of 60° or more. Increased loft has the effect of encouraging higher elevation on the shot at the expense of distance. A “lofted” shot is one that is played with the deliberate intention of gaining elevation, usually either to clear an obstruction or to minimise the extent to which the ball rolls on after hitting the ground. An old club, equivalent to the modern 5- or 6-iron. A more lofted club, equivalent to the modern 7-iron. At one time the commonest format for a game of golf, the result is determined on a hole-by-hole basis, the winner being the player who wins the most holes. A match play contest is decided as soon as one player has won more holes than there are left to be played, the result being given in such a form as “3 and 2” (i.e. 3 holes up, with 2 to play). Only in match play does a player have the right to “concede” a hole: to recognize that the opponent has holed out in fewer strokes than the player has already taken, and so that the opponent has won that hole. In medal play (strokeplay) each player must hole out at every hole in order for the total number of strokes taken by each to be comparable when added up and adjusted by the players’ handicaps. To hit a ball “on the meat” is to hit it squarely so that the maximum energy is transmitted from the club head to the ball, and so that it flies straight and strongly. Now by far the commonest format for golf tournaments, the result is decided on the basis of the number of strokes accumulated over the entire round (medal score), as adjusted by players’ handicaps. Medal play (also known as strokeplay) and match play require different tactical approaches and are played under somewhat different rules. An old club with a heavy iron head, roughly equivalent to the modern 9-iron or wedges; it was used for pitching and bunker shots. Having completed the first nine holes of a course. An excellent golf shot; one that goes just where it is supposed to go. “Out of Bounds” is ground on which play is prohibited. In its wider sense, this applies to anywhere outside the boundaries of the course, but the Committee can designate any area to be “out of bounds,” provided that the area is marked as such. A player whose ball goes out of bounds incurs a penalty of one stroke and must play another ball from the same spot (i.e. stroke and distance applies). A way of gripping a golf club in which the little finger of one hand rests between the middle and index fingers of the other hand; this is the most popular grip among both amateurs and professionals. The overlapping grip is sometimes known as the Vardon grip, after Harry Vardon, who popularised it. Par for a hole is the score that a scratch golfer should make. Par is determined by distance, not by difficulty, and includes an allowance of two putting strokes. Thus a short hole, where the green is reachable from the tee, will be given a par of 3, while a long hole, on which the green can normally be reached only with a drive and two further shots, will have a par of 5. 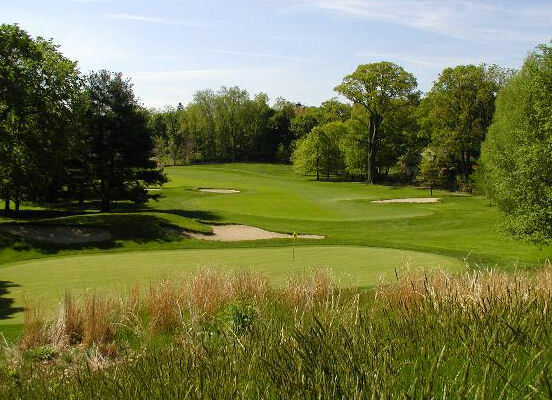 Most golf courses have a mix of holes of par 3, 4 and 5, the overall par for the course being usually between 70 and 72. A penalty is incurred for any breach of the Rules of Golf. Minor infractions incur a penalty of one stroke, which is to say that the player must add one stroke to his overall score (in medal play) or to his score for the hole (in match play). More serious breaches incur a penalty of two strokes (medal play) or loss of the hole (match play). In tournament play, the most serious offences result in disqualification. A lofted shot, usually played as an approach shot to the green. Unlike a chip shot, in which the ball has a low trajectory and rolls for some distance after landing, the pitch shot has a high trajectory and the ball rolls little, if at all, after landing. A pitch shot is often played with backspin, which has the effect that the ball stops dead on landing, or even rolls backwards. A pitch shot is often the only option when a hazard such as a bunker lies between the ball and the green. Rotation of the player’s body during the golf swing. A style of golfing breeches popular in the era of Wodehouse’s golf stories; cut with an extra four-inch length of fabric at the knee compared with regular knickerbockers, so that the fit is baggy and unconstraining. To press is to try to hit the ball harder than one’s usual form; this typically results in tension and thus a lack of accuracy. Short for “professional,” which encompasses all those who earn an income from golf, whether as players, coaches, writers, or whatever. In Wodehouse, “the pro” invariably refers to someone attached to a local club and who earns his livelihood by giving private lessons and selling and repairing golf equipment, rather than to a professional golfer in the modern sense, as one who makes a (usually far more handsome) living from playing in professional tournaments. A stroke played on the green, with the intention of striking the ball into, or close to, the hole. A club specifically designed for putting strokes and employed almost exclusively on, or in close proximity to, the putting green. That part of the playing area of the course outside the tees, fairways and greens. In the vicinity of the greens and alongside the fairways, the vegetation in the rough is usually kept trimmed, but not mown (“light rough”); elsewhere, the natural vegetation will often be allowed to grow unchecked. In the course diagram, the light rough is shown in dark green; the areas shown in pale green are deeper rough. A round of golf consists of 18 holes, played consecutively. While a round usually commences at the first hole and continues until the 18th has been completed, it is not unusual, on congested courses, for some players to start at the 10th hole, playing holes 1–9 after 10–18. A zero handicap. Hence, a scratch golfer is one who plays off a zero handicap. The very best golfers have “plus” handicaps, which require them to add strokes to their score, to give a net score. That part of the game which is played on and in the vicinity of the green; the term is used as shorthand to encompass short-range shots, usually not involving a full swing, such as pitching, chipping, putting, and greenside bunker shots. The opposite of a hook: a shot in which, for a right-handed player, the ball curves strongly to the right in an uncontrolled manner (as distinct from the controlled fade). An old name for a fairway wood, equivalent to the modern 3-wood. A player has “taken a stance” when he has placed his feet in position for making a stroke. Under the Rules of Golf, a “stroke” is the action of bring the club forward with the intention of striking the ball. The term is also used in reference to the number of shots that a player has taken (or is deemed, by penalty, to have taken). Handicaps are counted by numbers of strokes, as are scores in medal play; in match play (the commonest form in Wodehouse), each hole is won, lost, or halved (tied) based on how many strokes each player used on that hole, but the ultimate score is counted in number of holes won. Handicaps expressed as “giving a stroke a hole“ or “a stroke per” are a clue that match play is in progress. In some circumstances (as, for example, when his ball has been struck out of bounds or cannot be found), a player is required to play another shot from the same position as the previous one, while also incurring a penalty of one stroke. Note that the penalty stroke is in addition to the original stroke so that, for example, a player who strikes his tee shot out of bounds and, by rule, is required to play again from the tee will be playing his third shot. A player can opt to accept this same penalty (known as “stroke and distance”) at any time, if he considers that this is the best option available to him, given the position in which his ball lies. Originally, this referred to a situation that arose in match play when a player whose ball was on the green could not play directly at the hole because his line was blocked by another player’s ball: the rules pertaining to match play did not allow the opponent’s ball to be lifted (as they did for medal play) but nor did they impose any penalty if the player’s ball struck his opponent’s. In 1952, the rules governing match play were changed and the stymie was abolished. A player whose ball is on the green and who is laid a stymie can now (as he previously could in medal play) require his opponent to lift his ball; however, as a hangover from the pre-1952 rules, he incurs no penalty if he makes a putt and his ball strikes his opponent’s. In medal play, when both balls are on the green prior to the putt, a player whose ball strikes his opponent’s incurs a penalty of two strokes. “Stymie” is now used in reference to any situation in which a player’s approach to the green is blocked, as, for example, by a tree. The initial part of the golf swing, when the clubhead is moved back from the ball. The tee is the area, usually slightly elevated above its surrounds, from which the initial shot is played at each hole. On many golf courses, there are several tees for each hole, the frontmost being for the ladies (shown in red on the course diagram), the next back being for the men (shown in white), and the rearmost being for club tournaments (shown in blue). If the course is used for professional championships, there will often be a further set of championship tees, set still farther back. Also called the “tee” is the means of elevating the ball above the surface of the ground, formerly a little pile of damp sand, latterly a spike of wood or plastic with a concave top on which the ball is balanced. The teeing ground is the specific area on the tee from which tee shots must be played. It is a notional rectangle, two club lengths deep (from front to rear), the front corners of which are marked by tee markers. In principle, there is no reason why the tee box and teeing ground should not coincide. In practice, and given the heavy wear and tear which the teeing ground suffers, a larger tee box is advantageous because it allows the greenkeeper to rotate the position of the teeing ground from day to day, spreading the wear and tear over a wider area. Two tee markers (sometimes referred to as "blocks" or "discs"), one on each side of the tee, mark the front corners of the teeing ground. The markers may, at the discretion of the Committee, be placed anywhere within the teeing ground (subject only to the restriction that they cannot be closer than two club lengths to the back of the tee). At many courses, the position of the markers is changed from day to day, in order to spread the inevitable wear and tear on the teeing ground. Striking the ball above its “equator,” thus causing it to skip and bounce along the ground, instead of rising into the air. The place between the first nine holes (out) and the second nine holes (back) of an eighteen-hole course. To wave the club head back and forth over the top of the ball in the direction of the planned stroke; done immediately before addressing the ball. A water hazard is any area designated as such by the Committee. Although water hazards are usually areas such as ponds, lakes, streams, drainage ditches, even the sea, it is not actually necessary for a water hazard to contain water! In the course diagram, the stream running across the 2nd fairway would be designated a water hazard. A hole on which the approach to the green necessitates hitting a shot over water. An iron club with a large amount of loft and specifically designed for short-range elevated shots (pitching wedge) or for playing out of bunkers (sand wedge, or sand-iron). Traditionally, and until relatively recently, a wooden-headed club used for driving off the tee (the driver) or for long shots from the fairway (fairway woods). Although the name continues in use, the head of the vast majority of modern woods is made of metal or a composite material (for which reason they are sometimes referred to as “metal woods”). Woods, like irons, are usually numbered, the loft of the club-face increasing with the number.